White spots on your tonsils are usually caused by a viral or bacterial infection. Some of the most common reasons for the white spots appearing on your tonsils are strep throat, tonsillitis, yeast infection, or mononucleosis. Along with the whitish patches at the back of your throat, you will probably have other symptoms that can help identify the cause of the infection. While it can be fairly straightforward to treat the infection and get rid of the white spots on your tonsils, you should always have a doctor check it. If left untreated, the infection can get worse and spread. Sometimes, white spots on your throat can be a sign of a more serious condition. In this article, you will find out what causes white spots on your tonsils. You will also find out about the best remedies to treat the tonsil infection. It’s important to know the reason for of any kind of white spot or patch on your tonsils. The best course of treatment depends on treating the underlying cause of the infection or inflammation. A bacterial infection caused by the Streptococcus bacteria is a common reason for white spots on your tonsils. This can also cause a severe sore throat and be even more painful than tonsillitis. If you have swollen tonsils, a runny nose, or a low fever under 101°F (38.3°C) then is most likely that you have a viral infection. To get rid of white spots on your tonsils caused by strep throat, there are many effective home remedies that are great for treating mild infections. You can use cayenne pepper as a medicine to help get rid of a strep throat. The active ingredient in cayenne pepper that is useful for treating throat infections is capsaicin. This is the compound that gives cayenne pepper and chilies their kick. To make a home remedy to treat a sore throat and its symptoms using cayenne pepper, mix 1 teaspoon of cayenne pepper with half a cup of coconut oil. Because capsaicin is strong and might hurt your throat, and since it is well absorbed by your skin, apply the capsaicin paste to the skin on your throat and on the swollen lymph nodes on your neck. You can also use essential oils to treat bacterial throat infections or probiotics to boost your immune system and help to prevent bacterial infections. These natural remedies are discussed in my article on the best natural remedies for strep throat infections. Another common reason for white spots appearing on your tonsils is tonsillitis. Tonsillitis is caused when the tonsils become infected and inflamed due to a viral or bacterial infection. Doctors from the Mayo Clinic say that the main symptoms of tonsillitis are a yellow or white coating on inflamed tonsils, sore throat, white patches on throat, difficulty swallowing, enlarged lymph nodes, and a headache. If a bacterial infection has caused a serious case of tonsillitis, your doctor may prescribe a course of antibiotics. In this case, please read my article on what to do to restore healthy intestinal flora if you are on antibiotics. There are simple home remedies to relieve the discomfort caused by tonsillitis and get rid of the white spots on tonsils. Mix 1/2 to 1 teaspoon sea salt in an 8 oz. glass of warm water. Gargle several times a day to get rid of the infection and the white spots on tonsils. Put a teaspoon of dried Echinacea and a 1-inch piece of chopped ginger in hot water, cover, and let it steep for several minutes. Allow the tea remedy to cool and add some lemon and honey to boost its medicinal properties. Drink 2-3 times a day to help cure your tonsillitis faster and get rid of its symptoms. To find out more about why you should use Echinacea when you are ill, please read my article on how to use Echinacea tea to boost your health. Echinacea tea and a salt water gargle are just two of the many ways to cure tonsillitis naturally. Tonsilloliths cause whitish stone-like bumps to appear on your tonsils. These look like small white stones that are embedded into your tonsils which is why they are also called tonsil stones. Unless you have an infection along with the tonsil stones, the white spots on your tonsils won’t cause a fever. Dr. Friedman explains that the other common symptoms of tonsilloliths apart from white spots on the back of throat are bad breath caused by bacteria and a sore throat. You may also have difficulty swallowing and suffer from ear pain. Many tonsil stones don’t require any special treatment. Some people use picks or swabs to gently remove the white stones from their tonsils. A salt water gargle can also help to kill off bacteria at the back of your throat and relieve the discomfort that tonsil stones can cause. If you have tonsil stones and want to know what else you can do to prevent them forming or get rid of them completely, please read my article on natural ways to treat tonsilloliths. A candida fungal infection can cause white patches to form on your tonsils as well as affecting your tongue and back of your mouth. The yeast infection that causes oral thrush is caused when there is an imbalance of “good” and “bad” bacteria. A common cause of oral thrush is taking a course of antibiotics. Doctors at the Mayo Clinic say that antibiotics can disrupt the delicate balance of microorganisms in your body and cause yeast to overgrow and affect your mouth.9 This results on creamy white lesions on your tonsils, tongue, and roof of your mouth. There are many practical ways to help restore balance to your digestive system and clear the symptoms of oral thrush. Virgin coconut oil is naturally antifungal and can help to get rid of the white stuff from your tonsils and back of throat. Mix 1-2 drops of clove oil or cinnamon oil with a tablespoon of virgin coconut oil. Swish the mixture around your mouth for a few minutes, taking care not to swallow any. Spit the mixture out, rinse your mouth with warm water and brush your teeth. Repeat the process once a day until you no longer have white patches on your tonsils or other parts of your mouth. Another natural way to cure oral thrush and treat its symptoms is to consume fermented foods. These act as probiotics to help to boost the good bacteria in your gut and improve digestive, cardiovascular and immune health. 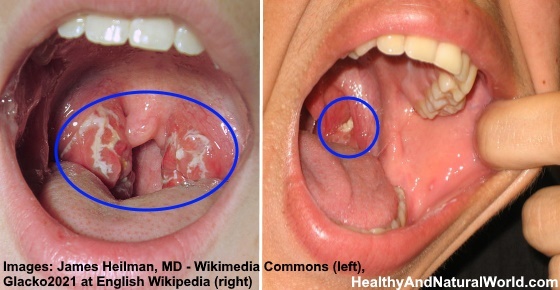 Or you can try apple cider vinegar to treat yeast infections and get rid of white oral thrush patches from your tonsils. Mononucleosis is a viral infection that affects the back of your mouth and causes white spots on your tonsils. Mononucleosis (or sometimes just called mono) is transmitted by the Epstein-Barr virus (EBV) through saliva and is common among teens. It can be difficult to diagnose and treat mono because the symptoms are similar to strep throat. Dr. Gregory Thompson on WebMD says that the other symptoms of mono are swollen lymph nodes and tonsils, a sore throat, fatigue, loss of appetite, and pain under your left ribs (caused by an enlarged spleen). In addition to getting plenty of rest, you can use a salt water gargle to help reduce the discomfort of a sore throat. You could also try using one of the natural pain killers that I’ve mentioned on this website. There are some less common causes of white spots on your tonsils. However, a white patch or sore on your tonsil isn’t the only symptom of tonsillar cancer. Doctors at Cedars-Sinai say that you may have mouth pain, blood in the saliva, severe ear pain, lump in the neck, or a persistent sore throat. A severe sore throat that comes on suddenly. It is painful to swallow. You notice pus on your tonsils. WebMD. Is your sore throat a cold, strep throat, or tonsillitis? Can Fam Physician. 2011 Jul; 57(7): 791–794. WebMD. Strep throat – what happens. WebMD. Mononucleosis – home treatment. WebMD. Oral health and leukoplakia. DermNetNZ. What is carcinoma in situ of oral cavity? HealthClevelandClinic. How to tell if your sore throat needs a doctor’s visit.